Should Human Stem Cells Be Used To Make Partly Human Chimeras? : Shots - Health News The National Institutes of Health has issued a moratorium on funding work that puts human stem cells into nonhuman embryos. The concern is that hybrids might develop human brain cells, sperm or eggs. Should Human Stem Cells Be Used To Make Partly Human Chimeras? Human stem cells, in this case made from adult skin cells, can give rise to any sort of human cell. Some scientists would like to insert such cells into nonhuman, animal embryos, in hopes of one day growing human organs for transplantation. 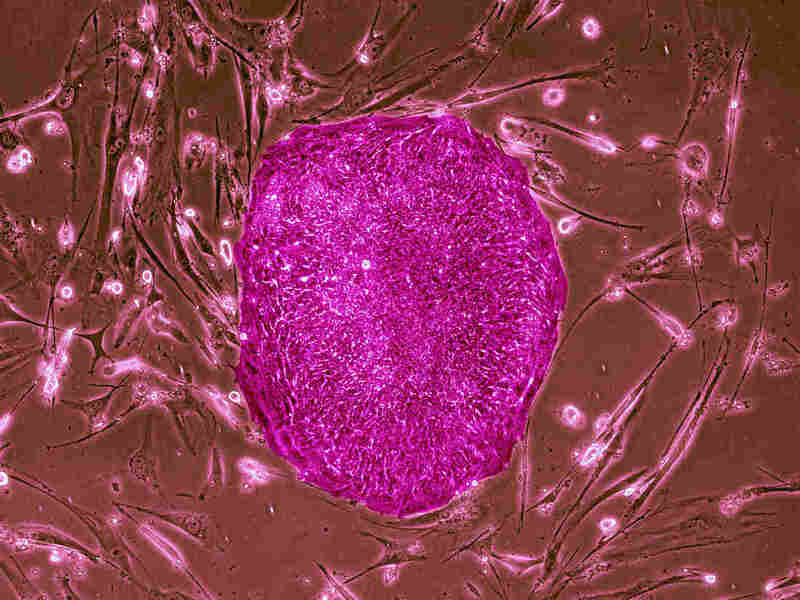 An intense debate has flared over whether the federal government should fund research that creates partly human creatures using human stem cells. The National Institutes of Health declared a moratorium in late September on funding this kind of research. NIH officials said they needed to assess the science and to evaluate the ethical and moral questions it raises. As part of that assessment, the NIH is holding a daylong workshop Friday. Meanwhile, some prominent scientists worry that the NIH moratorium is hindering a highly promising field of research at a crucial moment. Such concerns prompted several researchers this week, writing in the journal Science, to call on the NIH to lift the moratorium. "The shadow of negativity cast around this research is going to have a major negative impact on any progress going forward," says Sean Wu, a cardiologist and assistant professor of medicine at Stanford University, who helped write the article. The moratorium was prompted by an increasing number of requests to fund these experiments, says Carrie Wolinetz, the NIH's associate director for science policy. In the experiments, scientists propose to insert human stem cells into very early embryos from other animals, creating dual-species chimeras. "The science is knocking at our door," Wolinetz told Shots in advance of the workshop. She says NIH wants to "make sure that we are fully prepared from a policy and guidance point of view" before making decisions about such grants. Scientists have been creating partly human chimeras for years. Researchers use rats with human tumors to study cancer, for example, and mice with human immune systems to do AIDS research. What's new is putting human stem cells into the embryos of other animals, very early in embryonic development. "The special issue here with stem cells is that those types of human cells are so powerful and so elastic that there's great worry about the degree to which the animals could become humanized," says Insoo Hyun, a bioethicist at Case Western Reserve University. The goal of the research is to create chimeras that lead to new treatments for human diseases. For example, the technique might enable scientists to create better animal models for studying diseases in the laboratory. Researchers also hope to grow human organs in animals that would be closely matched to patients needing transplants. "This could have a big impact in the way medicine is practiced," says Juan Carlos Izpisua Belmonte, a professor of gene expression at the Salk Institute for Biological Studies. "We don't have enough organs for transplantation," Belmonte says. "Every 30 seconds of every day that passes, there is a person that dies that could be cured by using tissues or organs for transplantation." He tells Shots he thought he was on the verge of getting an NIH grant to pursue this research before the moratorium was imposed. The prospect of inserting human cells into early animal embryos raises a variety of concerns. Françoise Baylis, a bioethicist at Dalhousie University in Nova Scotia, Canada, says the engineering of creatures that are partly human and partly nonhuman animal is objectionable because the existence of such beings "would introduce inexorable moral confusion in our existing relationships with nonhuman animals, and in our future relationships with part-human hybrids and chimeras." Another concern is that the human cells could end up in the brains of the animals. That raises the prospect that "this will somehow give the animal a human consciousness, human mental capabilities," says Hank Greely, a bioethicist at Stanford University. In addition, some scientists and bioethicists fear the stem cells could create human eggs and sperm in the animals. "If you had a male mouse that had human sperm in it, that's going to be a concern to some people, especially if it's anywhere near a female mouse that has human eggs in it," Greely says. "To say the least, it's disconcerting to think about two mice making a human embryo." Still, Greely, Hyun and the scientists conducting the research all agree that the most alarming concerns are highly unlikely. And, they say, safeguards could be put in place to allow the research to go forward. For example, scientists could engineer the cells so that they were unable to form human brain cells, sperm or eggs. The animals could also be isolated or sterilized to prevent them from breeding. "There are certainly very effective strategies that would alleviate the concerns," Wu says.